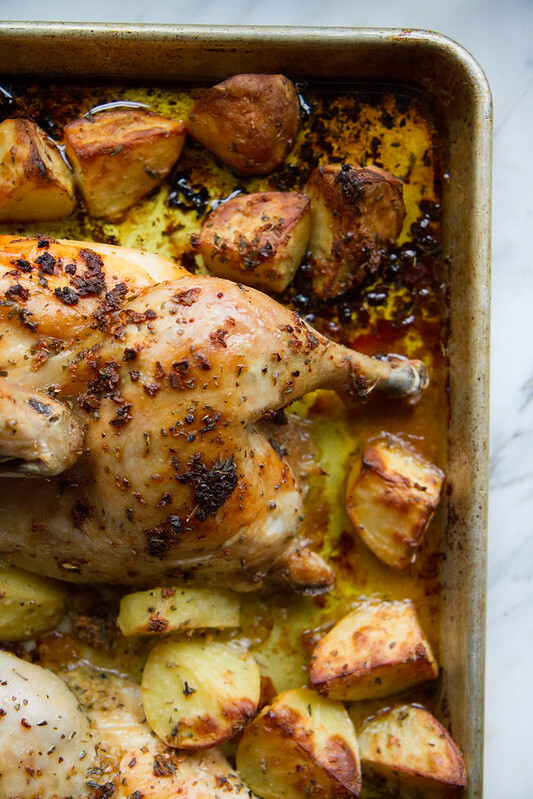 ever and you will never need another Roast Chicken Recipe as long as you live! This is probably the most beloved recipe on my entire site and hundreds of people agree! It was originally posted in April of 2011 and it was so popular that it even found a home in my first book and has been a staple meal in our house for a solid ten years. Any of you who are long time readers (thank you!!) you will have probably heard me wax poetic about this recipe at some point or another- maybe you have even made it yourself!? So I just had to make a video about it, right?! 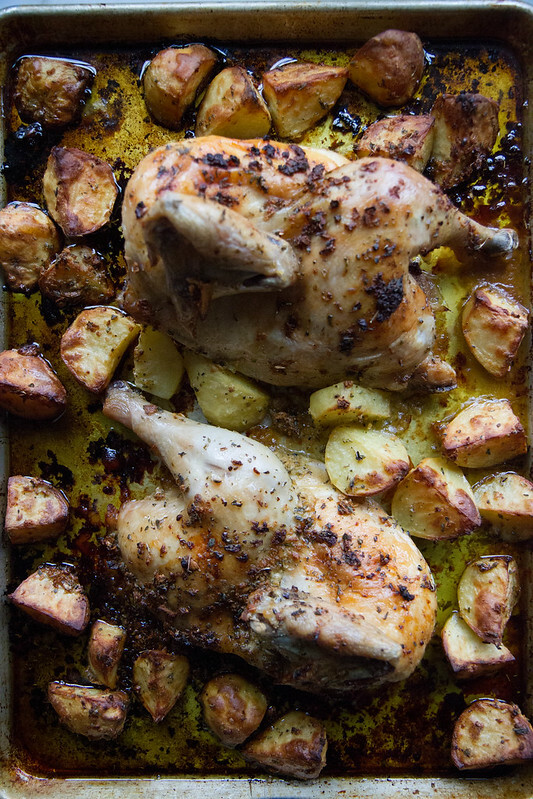 Perfect for entertaining, I will often do a double recipe of this Chicken and Potatoes for a crowd when I need something really easy. Since there is only a bit of prep before you just roast for 90 minutes, you have plenty of time to make a great salad and a veg in the meantime. You could even squeeze in a dessert before you pull the chicken out of the oven! OK. Also, even though I am updating this post, I couldn’t bare to scrap this excerpt from a funny story that lived here from December a few years ago, so I will just leave it below for your enjoyment. “Stuff is funny around here. The elf Toto (on the shelf) finally showed his face in an amazon express box after his predecessor somehow disappeared in our house work this last year. But seems like someone (ahem, ME) was a little rusty in moving that little bugger around each night. I get up really early and was sitting checking email and having a nice hot cup of tea at 5:30AM when I remembered that I never moved the elf. I ran into the living room and grabbed him. Just then, I hear Pia saying “mom, what are you doing?” but I realize it is so dark that she can’t see me yet. So I chucked the elf. Step by step photos and original post from 2011 HERE. Trim the tips of the chicken wings and any extra fat. Split the chicken in half with a sharp chefs knife, and place both halves, bones down, on a sheet pan. Squeeze all of the juice of one lemon on the chicken. Rub the halves on both sides of the chicken. Pour ¼ cup of olive oil. Generously season the chicken with salt and pepper and half of the oregano. Add about 5 cloves of the garlic to the chicken. Peel the potatoes and cut them into quarters. Place in a bowl. Add the remaining olive oil, oregano, lemon juice and garlic. Season with salt and pepper and toss the potatoes with everything until well coated. Pour the potatoes out onto the sheet pan with the chicken and all of the sauce. Roast the chicken at 350 degrees for about an hour and fifteen minutes or until the chicken and potatoes are golden and crispy. I love this recipe. I make it once a month and then use the leftover chicken and potatoes for a pot pie. SO GOOD! Yep, I love this recipe well deserved spot in your book. The elf on the shelf story LOVE!! Great meal for a chilly day! Love Greek food. This recipe looks so delicious and simple! Pinning! I’m seriously craving those potatoes, they look fab! This is a great recipe! That chicken is gorgeous! Oh my heck, this is perfect food for our cold weather! I have your book, Heather, but inexplicably I have not made this recipe from it. Time to give it a try. Clearly I can see how this would be the best chicken recipe!! 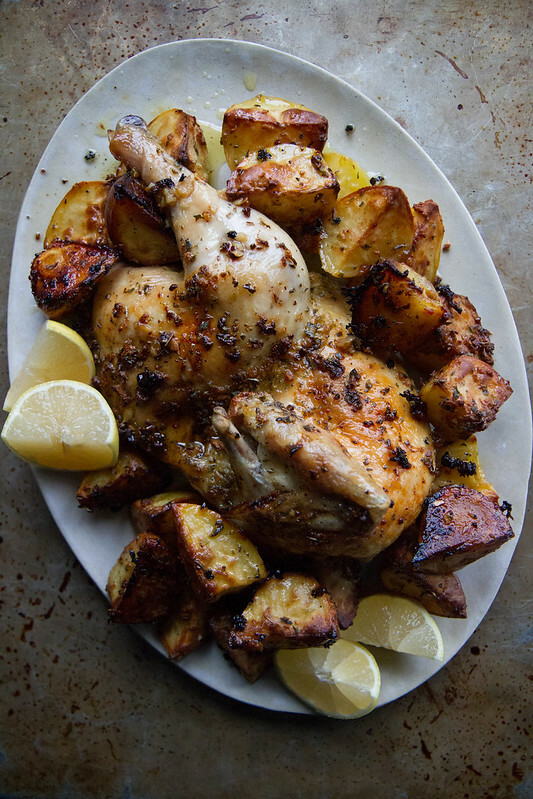 This was one of my favorite dishes growing up…that crispy crunch on both the chicken and potatoes and the LEMON! But now I can’t bring myself to eat chicken. Unless I know where the bird came from, it’s conditions and what it ate, nope just can’t do it anymore. Ahh the good ole days when chickens were chickens. Wow! The best chicken ever. This will be the recipe I follow for this. Can you use bone in breast only with this? Hi Cindy, you could use boneless chicken breasts, but you would greatly reduce the cooking time. I’m Greek and find it hard to find original recipes my mother and grandmother made throughout my childhood. This is the best ever!!!! Thank you so much. Today is the day to cook your recipe. Wonderful Diane!! So happy that you like this! In Wheeling, IL. growing up, Market Square restaurant opened around 1979. Their Grecian Chicken was my Dad’s favorite. Your recipe is the closest I have found in terms of awesome taste. I made it a few times.. Naturally, I made some tweaks.. Used organic, skin-on legs. Soaked in brine water 1.5 – 2 hours in glass bowl in fridge. Then drain, rinse & dry. Used rind of 2 lemons, used small side of box grater because I do not have a lemon zester,.. Added 1 TBS Rosemary powder, 1 Tbs. Honey, juice of an additional lemon, 2 TBS Celtic sea salt. Some fresh ground pepper for cooking, but applied most of the pepper right onto dish when it comes out of the oven.. Whisked all sauce in a glass bowl 1st, pulled skin away to get sauce on meat, then re stretch skin over drumstick & bake.. Thanks!!! I’m definitely making this tomorrow night…sounds delicious! Thank you! I love this recipe!! We use leg quarters instead of whole chicken cuz my family prefers dark meat. It turns out so fantastic every time! Ha, ha…I missed that one about the elf on the shelf! You are always so much fun! And I haven’t made this dish yet, but I am going now! Really sounds delicious….Thank you for making me smile (again and again) in the mornings…..
Well I am glad your poetic greek chicken voice shared this again, cause I GOTTA MAKE. you know I’d love! Love the new video and photos! Looks amazingly delicious and easy. I can see what it’s so popular! I need to try it out ASAP! I’ve got this in the oven RIGHT NOW!!! I can’t wait to eat it! I cannot eat Olive Oil !! Is there any good replacement oil I can use without totally destroying the the taste of the recipe ? Hi Ronald! What about trying Avocado Oil? Or melted coconut oil (the kind that has been refined to be less “coconuty”- I bet that would be delicious! While not the healthiest choice, you could always go with vegetable oil. The spices on this sound absolutely FABULOUS!! What a great dinner. I cannot find greek oregano. Can you use fresh or dried oregano? Phe-freakin-nomenal. I made it exactly as written and it could not have been better. My wife doesn’t cook, which I’m extremely grateful, and she asked if we could have this again tomorrow. This recipe is definitely in the rotation. Thank you, Heather. Made the chicken last nite. Very good and tasty. The recipe however is very confusing and needs work. I’m not a novice but is should be clear and concise, and it’s not. The recipe is beyond easy and clear. I am a novice as well. What part of the recipe did you find confusing? I so want to make this! Just from the looks of the recipe it reminds me of our times in Athens…yummm! My question is this: How much would it alter the recipe if I used regular (American) Oregano instead of Greek Oregano? I don’t have Greek Oregano but will get some if the taste really depends upon it. Hi Meg! Absolutely still make the recipe! Greek oregano just tends to be a little stonger but its still delicious no matter what! I use Mexican Oregano and it’s great! Very fragrant! Your Greek Chicken recipe will be the only one I follow again & again! Thank you! I made it a few weeks ago and was asked to make it again so we had it for dinner yesterday. I must add that, although I love cooking (and eating lol), cooking chicken usually intimidates me. But your video completely set my mind at ease and I tackled it successfully! I would like to ask however, how much longer that 90 mins do you find it takes to achieve the golden brown, carmelized garlic finished product? I had to pull my chicken out & set it under the broiler for a few minutes to finish it off nicely. My method however caused me to lose the added browning flavor of the garlic & oil that I see you ultimately achieved in the video. PS: Any chance you have, or can add, a recipe for Athenian Skirt Steak? I have more of a question then a comment. Do you ever flip the chicken or stir the potatoes during the cooking time? I’m going to make this for Easter dinner. It looks delicious! Nope Lisa! It is the best, because you can truly not worry about any of that! You just stick it in the oven and forget about it! I made this recipe for Sunday night dinner with friends and it was a huge hit! It was so easy since I prepped the chicken and sauce separately ahead of time. So quick to pull together and pop in the oven. Thank you Heather! You made me look like a pro! 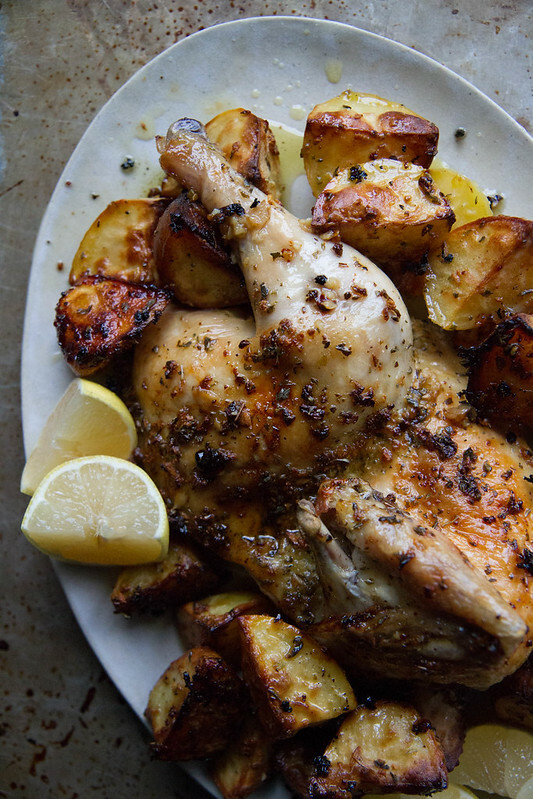 I want to make this recipe w/ chicken drumsticks & my potatoes are smaller. Is that ok? If so, how long should I cook the chicken & potatoes. I think 90 min will be too long.